You are here: Home » News » KeiperTech on Facebook! We’re proud to announce the addition of a Facebook page to better communicate with our loyal customers. Facebook has grown in popularity of the years and now we are joining the millions of users already on Facebook. By posting news, updates, photos, and videos on Facebook, we believe we can quickly communicate with our customers in a way that is convenient for them. As of May 1st, 2013, AP News reports that there are currently over 1 billion users using the social media giant’s website, and KeiperTech wants to be sure we’re reaching out to all potential customers, in addition to providing the latest updates and customer service to our existing customer base. KeiperTech is the worlds leading supplier of on-demand hydrogen generators, including it’s flagship KT-220 industrial hydrogen generator. 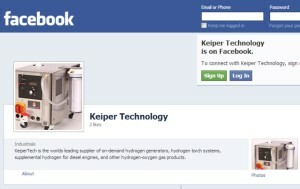 KeiperTech makes a variety of products including a hydrogen truck-box for supplementing diesel engines with on-demand hydrogen-oxygen gas, an industrial hydrogen torch system which replaces traditional bottled gas torches like an oxy-acetylene torch. As always, KeiperTech will continue to keep our website up to date with the latest product information, pictures, videos, and news about the company and it’s products.